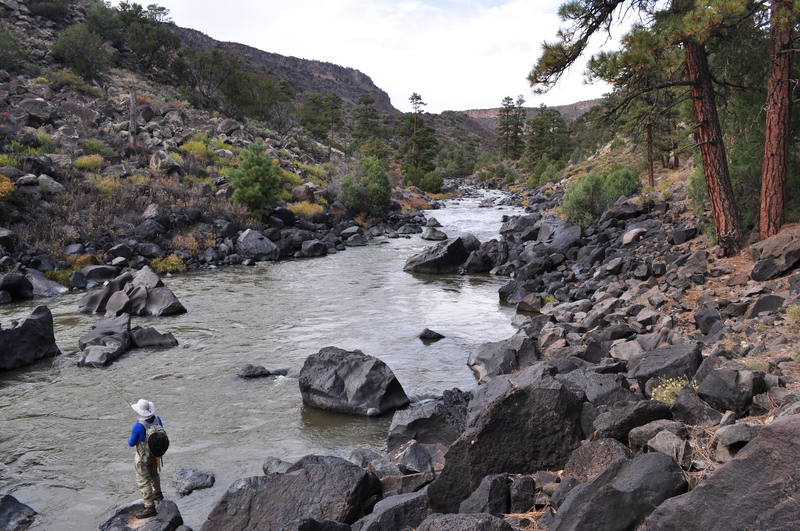 One of my favorite places to fish, if not my favorite place, is the Rio Grande as it stumbles through the Rio Grande Gorge. 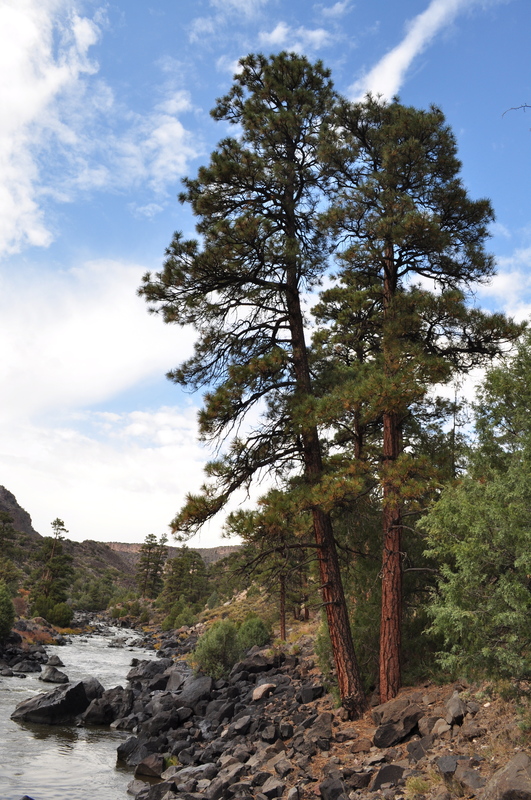 Located near the small Northen New Mexico town Cerro, the Wild Rivers section of the Rio Grande Gorge offers hiking, fishing, camping, sightseeing, backpacking and many other activities. I highly recommend visiting whether you are a fisher person or not, the hiking with scenic views and solitude is next to none. If you are a fisher person, this section of the gorge also has some of the widest variety of fishing available in the region as far as types of fish (trout, pike, carp) and river structure. You can spend the day high stick nymphing in the pockets of the Rio Grande or give a dry dropper rig a chance on the Red River. On this day, we agreed to give the Rio a shot. 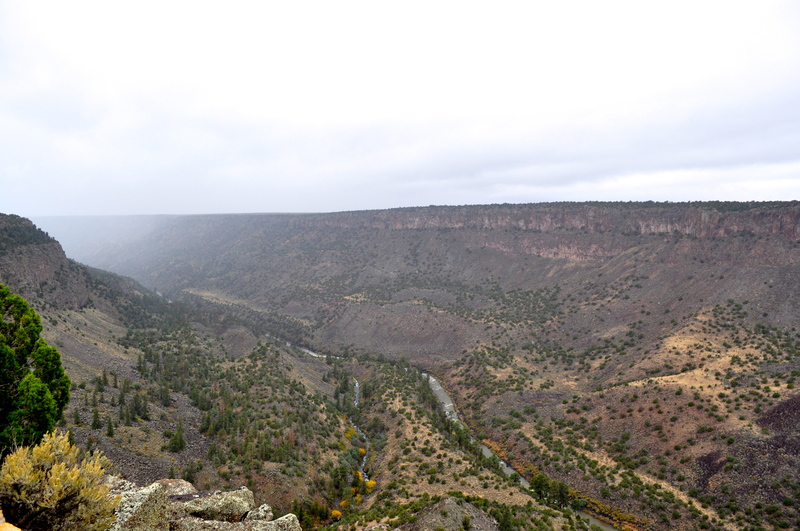 Deciding to spend an entire weekend in the area, we camped out at La Junta campground right on the edge of the gorge. The La Junta trail, which starts near the camping area, takes you down to the confluence of the Red River and the Rio Grande as seen in the image above. This is a stretch on the Rio I haven’t really fished. I mostly spend my time near the Big Arsenic trail which is a hike that takes you into the gorge about 2 miles (very rough estimate) upstream of the confluence. It is amazing how much the dynamics of the river change in these two miles. From fast deep pockets to slow meandering pools, new fisherman to the area will quickly learn where these larger fish like to position themselves or, if you are a tough learner like me, you’ll spend a few trips wondering why there is all this fuss about this “gem” of a river. If you pick the right fly and time of year, just once, you’ll find yourself coming back time and time again to run down that trail in the morning, brave the slippery giant basalt boulders on the rivers edge all day, and slog your way back up the trail in the twilight of the evening. The solitude and amazing scenery doesn’t hurt either. We woke up early Saturday to a very strong wind and some rain. Although my fellow fisherman were amazed with how fast I set my tent up the night before, I ended up paying the price for such haste. You see, I saved so much time because I didn’t put my rain fly on! Needless to say, I quickly got out of the tent that morning and threw the fly on to prevent as much wet sleeping bag as possible. There is a general rule in New Mexico, if you don’t like the rain go inside, or in this case, go back to sleep for 30 minutes, and it will all be gone. Sure enough, the weather started to clear and the day ended up being sunny and mostly calm. We cooked some breakfast, slammed some caffeine and geared up for our trek down to the river. We saw some other fisherman at the trail head who were going down to fish the Red, lucky for us. For reasons unknown to me, the flows were very high for this time of year. Usually, we see an increase in flows around the end of October or beginning of November, coinciding with the end of the irrigation season . Maybe the reservoirs were letting out water to prepare for the predicted “wet” winter. Hopefully, this was a smart idea. Ideally, you would like flows in the 100 – 150 cfs range, for this day they were sitting around 350 cfs and a little off color. If you are interested in seeing current flows click here. We headed down the switch backs, a small ladder and a set of steel stairs to make our way to the river. We started fishing a little up from the confluence. This stretch of the river is composed of large sections of slack water, or pools, separated by fast rapids and pocket water. I can’t tell you all of my fishing secrets, but I started fishing an area where I thought there had to be a fish. Like I mentioned before, once you’ve learned how to approach the Rio you’ll see spots you just KNOW are holding fish. I quickly caught a small brown trout and moved a little further up into the pocket (okay, there is a small hint!). I slung my self-tied “poundmeister” up into the start of the hole and, before I knew it, my line strangely moved to the side. I set the hook and the fish went straight out to the fast water and down stream. Luckily, directly below me was a large pool with little current and I patiently brought the 16-18 inch fish in. Not a bad second fish of the day! The rest of the morning we worked our way up catching a fish here and there as we made our way to the Little Arsenic area, one of two major springs in the nearby vicinity. I even spotted a good sized brown trout taking subsurface near the bank and was able to make a nice approach and cast to lure him in. That is a little unusual for the this river. As we neared the Little Arsenic area I noticed a large bird in the basalt boulders near the rivers edge. I crept along trying to get a better view. As I got closer, I realized it was a bald eagle. Unfortunately, a very dead bald eagle. A picture is included in the extra photos near the end of the post. 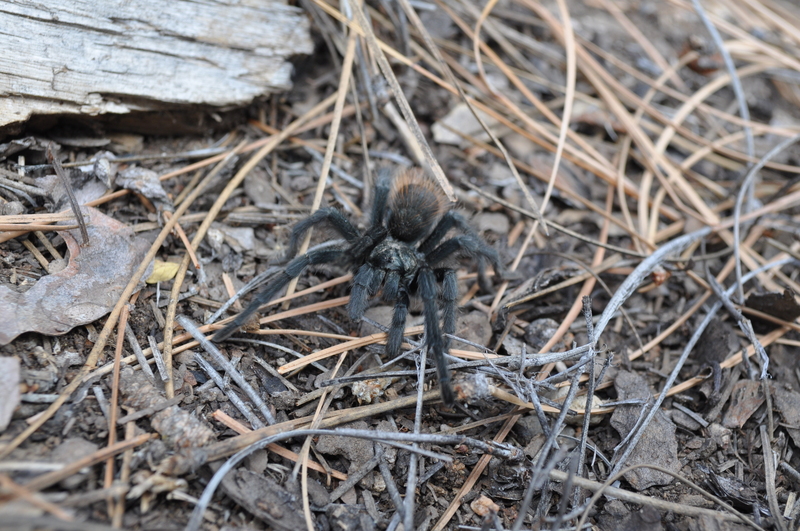 Shortly after crossing paths with the unlucky bird, I heard Nate yell “Check this out!” I made my way over to see a small tarantula in search of a female compadre. A tarantula in search of a lady. This little guy was on a mission, not stopping for anyone to take a picture. The closer we got to Little Arsenic the faster the water got and the harder it was to get around. When the water is clear wading isn’t as bad, but, when you are crossing your fingers with every step you take, its only a matter of time before you end up chest deep with water pouring into your waders. The goal is for that not to happen! The basalt is slick and in some areas the boulders can stack up. One step you are ankle deep, but that next step might put you over the edge into waist deep water. For this reason, I don’t like to fish here alone anymore, even though I’ll still do it. Todd fishing a slow run near the Little Arsenic area. You can see how demanding navigating the rivers edge can be. We wrapped up our day right above Little Arsenic with just enough light to make our way back up the trail. Instead of heading back to La Junta we went up Little Arsenic trail and took the rim trail back to the campground. 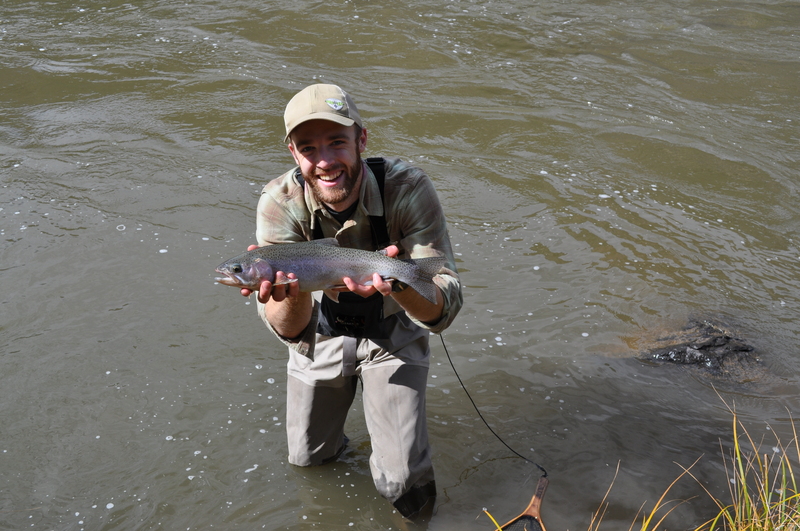 The fishing was a little tough this day due to the high flows and turbidity. It makes getting to that sweet spot just a little out of reach. 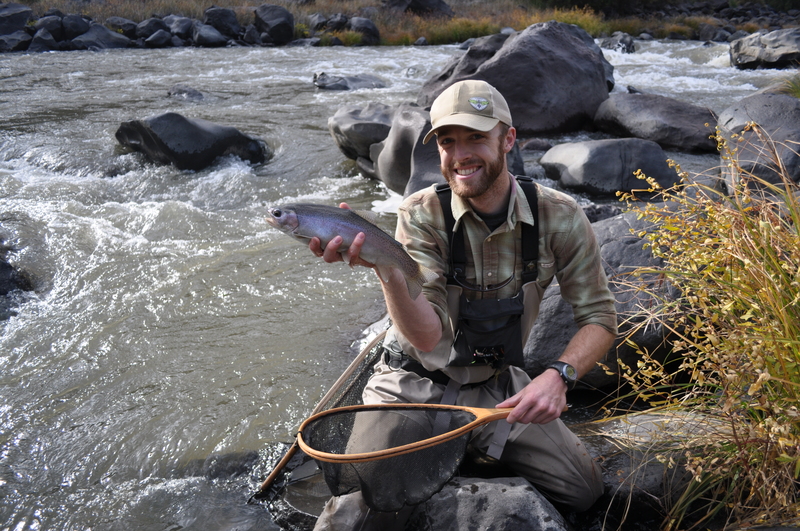 We were still able to catch some nice fish and enjoy a beautiful New Mexican Fall day on the Rio Grande. Our GPS files for heading into and out of the canyon can be found here, respectively. 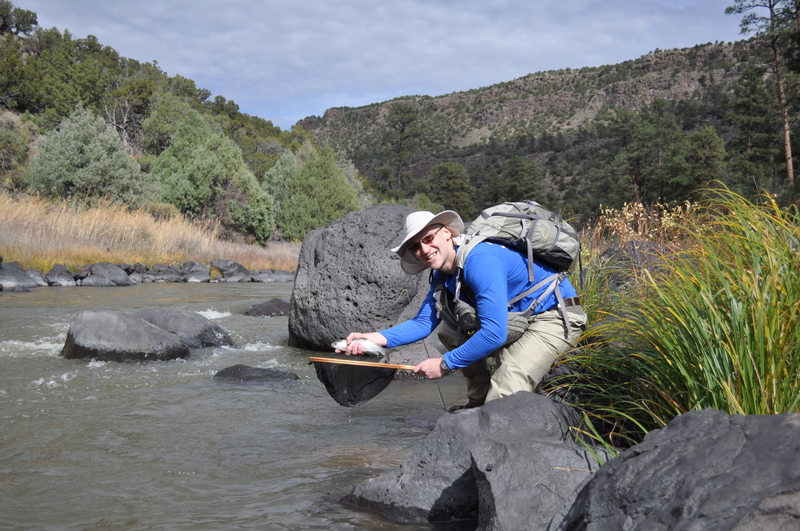 If you are interested in finding more information for fishing this section of river I recommend checking out Taos Fly shop, http://www.taosflyshop.com, and highly recommend the book Flyfisher’s Guide to New Mexico by Van Beachem. Link to book on amazon here. 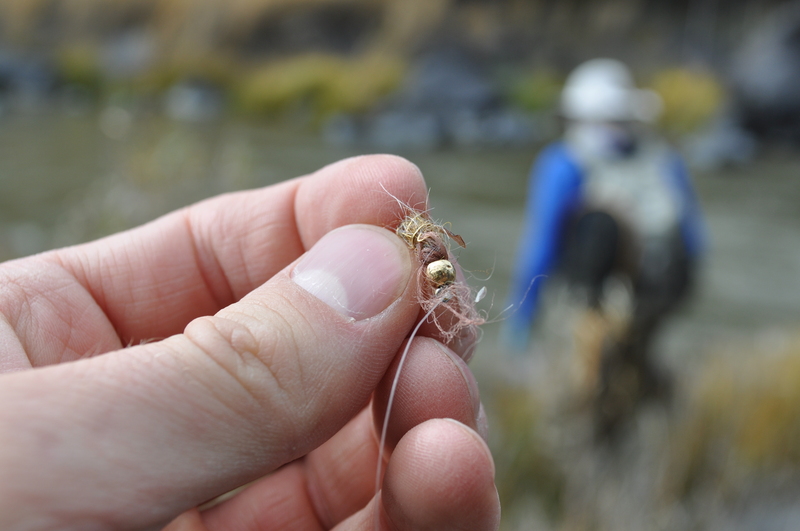 What your fly might look like after a few tough fish. This is the aftermath of one of my poundmeisters. 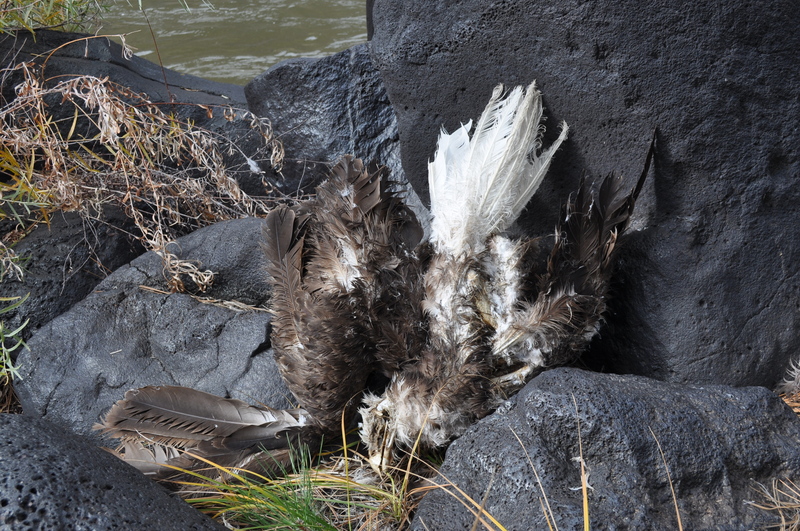 The deceased bald eagle we found near Little Arsenic. Not quite as cool as seeing one soaring high above. 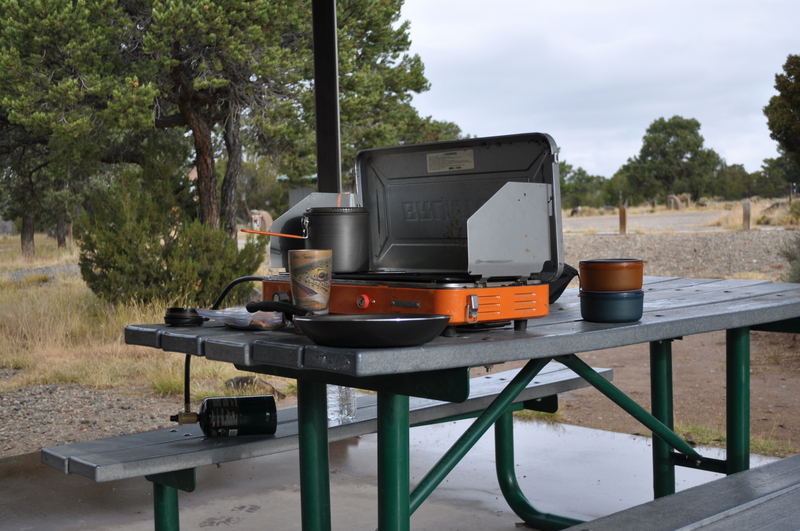 Making a little coffee on a rainy Saturday morning before we get busy fishing. After a summer of backpacking, car camping is a blessing. 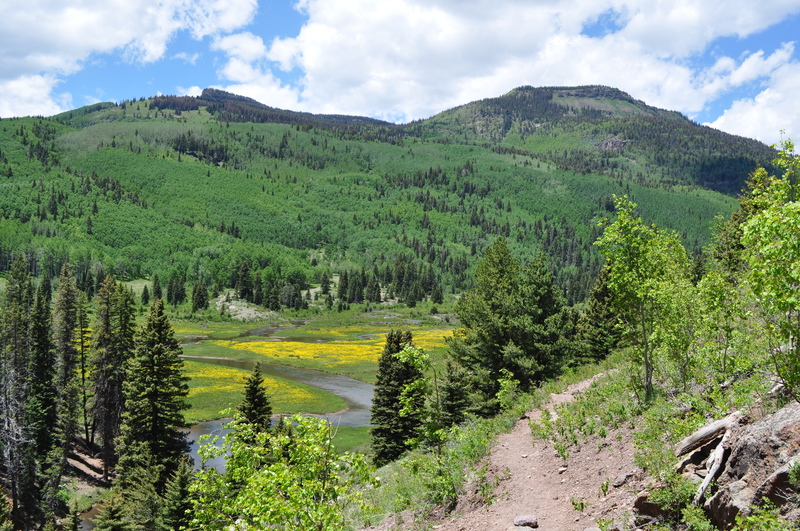 ← Around the Mountain – A great Fall ride!